Progress is a term with which we are all familiar and one as embedded in our consciousness as it is in the very foundation of our society. Although growing and advancing are vital to our future, it’s also important for us to understand the past and acknowledge how far we have come before continuing forward. With our focus on what’s ahead, sometimes we forget to reflect on how we arrived where we are. Taking the time to look back on our history helps us stay grounded, feel connected to our roots, and have a greater respect and appreciation for loved ones from generations past. As we look forward to what is coming next in our lives, we often want the latest and greatest, and our homes are no exception. Shopping for and buying a new piece of home décor can be exciting, but sometimes it’s fun to look inward for aesthetic inspiration. 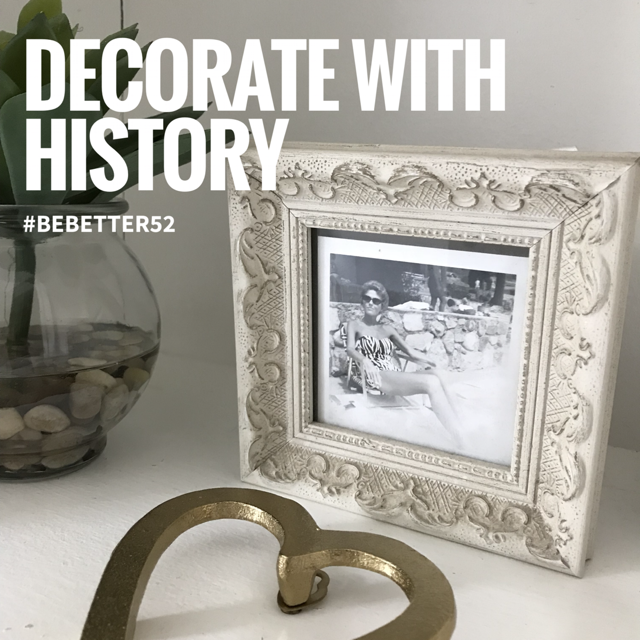 This week’s #bebetter52 challenge is to become creatively nostalgic and decorate your homes with personal history. There are endless ways to do this, whether it be through framing an old photo from your childhood (or from your grandparents’ childhoods), or by giving a hip new twist to a sentimental family heirloom. Decorating with history is easy on our wallets, stimulating for our creativity, and brings warmth and love to our homes. While completing this challenge, we encourage you to spend time with family and bond over learning more about your family history. This can be as simple as telling stories from your childhood to your children, or looking back on old photos with your siblings, to doing some research into your genealogy. Regardless how far you take your journey into the past, let it be an opportunity to spend quality time with the ones you love. This week we can’t wait to see the fun and meaningful decor you create centered on your family!